Typically, when we think of World War I we conjure images of muddy trenches, no man’s land, and German U-Boats in the Atlantic. However, the war encompassed more than just Europe and had lasting effects that are still apparent over a century afterwards. This is true even more so regarding the Middle East. 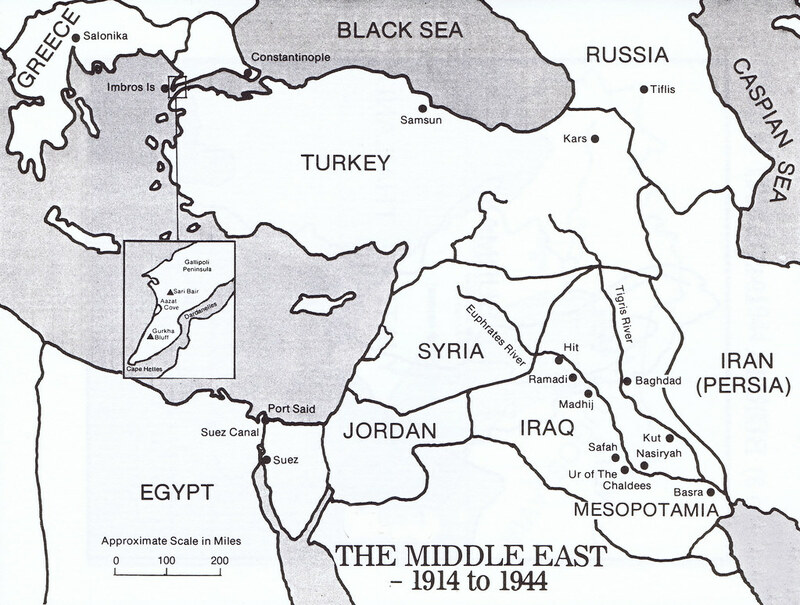 The loss of life from the Great War was greater among Middle Eastern countries than in Europe. Gelvin says, “While Germany and France lost, respectively, about 9 and 11 percent of their populations during the war, estimates for Ottoman losses run from 12 percent of the population to as high as almost 25 percent—approximately five million out of a population of twenty-one million.” Civilian populations were hit especially hard as 4 out of 5 Ottoman citizens who died during the war were noncombatants, which includes the genocide of 1.5 million Armenians. Nationalism was the ideological glue that helped bond many of these new nations together, as well as the driving force behind revolution and the opposition to foreign control. Zionist, which strove to establish a nation of Judaism led to the establishment of Israel, and in consequence led to the Israel/Palestine conflict. The creation of Israel relied on both the national ideology of Zionism, and the state building mandates of the victorious Western powers. Nationalism variated according to region and political conditions in Turkey, Syria, and Egypt as well. State-building by decree was more advantageous to the state-builders than it was for the states themselves. The Western powers had long been waiting to exploit Ottoman territory. For example, Russia, “hoped to realize its long-standing dream of acquiring a warm water port by laying claim to the Turkish Straits. What made this dream all the more compelling was the fact that almost 40 percent of Russia’s exports passed through the straits.” Great Powers would use whatever pretense or justification they could to insert themselves in the post-Ottoman Middle East. France claimed to have a historic right to Syria and Lebanon, based on the Christian population that resided there. State-building by revolution and conquest had the advantage of establishing a more stable regime, however, they also resulted in autocratic and arguably totalitarian governments. Iran and Turkey can be given as examples. Both nations came under the control of a military leader in the aftermath of the Great War. Both regimes were intent on modernizing their nation based on the ideas and institutions of the West. Both regimes cannot be described as liberal free states that allowed basic civil rights and freedom of expression. Gelvin says, “In addition to being Westernizers and secularizers, Mustafa Kemal and Reza Khan might also be viewed as heirs to the defensive developmentalists of the nineteenth century. Like their forebears, both attempted to expand the role of the state, centralize power, and spread a single, official ideology to bind citizens to each other and to the state.” The forced ‘westernization’ of the population in both states hardened resentment of western civilization and foreign influence. This is particularly true for Iran, which stopped being called Persia during Reza Khan’s regime, which saw a religious revolution in 1979 and the establishment of an Islamic Republic with a constitutional government. Rogan, Eugene. The Fall of the Ottomans: The Great War in the Middle East. New York: Basic Books. 2015.